Winry is now 2 years and 7 months and our potty training was a very gradual process that started when she was 18 months. I was pregnant with our second child which would arrive when winry was around 22 months. I had read about regression and that potty training should be avoided around major life events… I considder getting a sibling a pretty major life event for a toddler. So I had two choices – get it done well in advance or waiting until the new baby was a few months old. 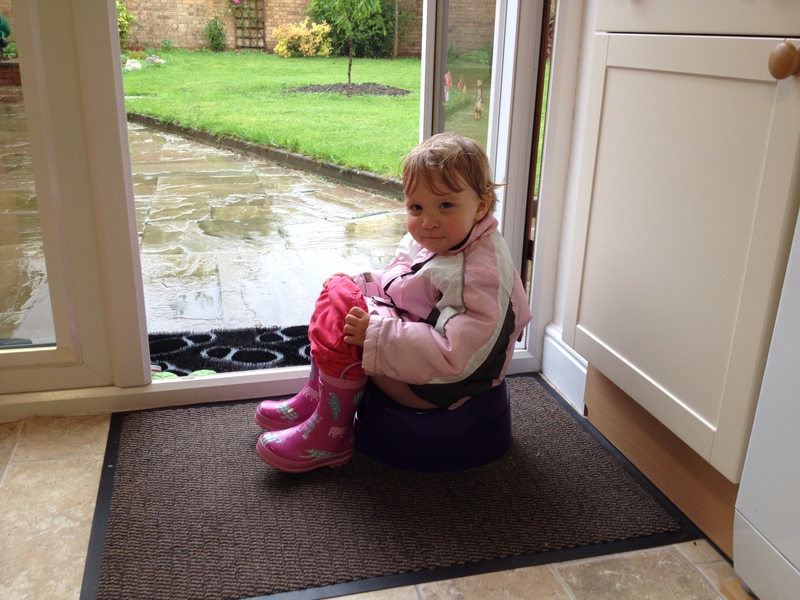 So we bought a potty when she was about 18 months to see what she made of it but she wasn’t ready and we didn’t want to push her. The decision was made to postpone until after the baby had settled into our family and we were in calmer waters. But the potty remained sitting there in the bathroom, she saw it everyday and when I went to the loo myself she would sometimes sit on it with her nappy on and pretend to be like mummy. Sometimes she would even sit on it properly before having her bath at night and once or twice she even piddled in it which was then followed by heaps and heaps of praise. The new Baby arrived and shortly after this we moved house, then it was christmas, then we were ill, to cut a long story short we kept putting it off although she was probably more than ready by now. I was beginning to feel a little guilty so we made the decision to just go for it with a no nonsense approach… no training pants or pull ups or in between stages. We got her a few packs of knickers and since they featured peppa pig she instantly loved them. We picked a day on which we would stay home and explained to her that she would need to go to the potty if she needed a wee or a poo. she wears a nappy for her nap and at night but is in knickers any other time. She wipes herself after a wee but has assistance after a poo. She dresses and undresses herself, goes to the bathroom by herself and just comes to tell me to clean her potty when she’s done. She had two little accidents where she went but didnt quite get her kickers down in time. No stress or hassle – just pride and watching her grow up into her own little independant person. I don’t find my own mother a very reliable source of wisdom due to the fact that I pretty much raised myself. I was born in 1988 in Thuringia – a “state” of eastern Germany which was formerly part of the DDR. The Wall stood from 1961 to 1989 and so my mother grew up in a World where the State and Government thought for you and you did what was expected of you. After you had your first child you wre granted only 8 weeks of maternity leave before returning to work full time and leaving your child in childcare. Here every child was treated the same, taught the same and followed the same schedule. As a parent you had to make very few decisions on the upbringing of your offspring. Almost no one in the general public questioned this and it seems as though most people actually preferred it this way. living cost and general attitude and mentality. When I was 4 we moved to a small market town near Mainz – western Germany, since my stepfather found better paid work here. But not long after the move the marriage broke down. So my mum was a single parent from the time I was 5 and worked double shifts in the restaurant Industry throughout my entire childhood. My two older brothers (one of them 8 years my senior the other 12 years) were tasked with looking after me when my mother was at work. It is what it is and it has made me a very self sufficient independant person from a young age which served me well so far. I have two older Brothers who have children themselves and I can ask them for some advice but as they both work full time and are not part of the traditional nuclear family structure themselves, this source of wisdom is also limited. I have Books that advise on everything from trying to conceive, Pregnancy, Labour and Breastfeeding to sleep, weaning, naps, discipline, play, potty training, siblings and more. In fact, whenever I find myself needing reassurance or another perspective I turn to amazon in search of a book. I must admit that I have found the Parentng experience so far sometimes very confusing. After trying to conceive for two years for out first Baby – I wanted everything to be just perfect and while some things seemed to come naturally and without effort others most certainly did not … wherever you looked and whomever you asked seemed to have a different opinion – it soon occured to me that there is not one right way but rather a hundred different choices and decisions and only you and your significant other to figure out what to do. For when you do the same chores each day every day running a household with two small (exploring, enthusiastic, messy) children seems fairly simple on paper, not factoring in the emotional demands of two little human beings that rely entirely on you in every way. Recently I have found myself raising my voice to my little girl a few too manny times. 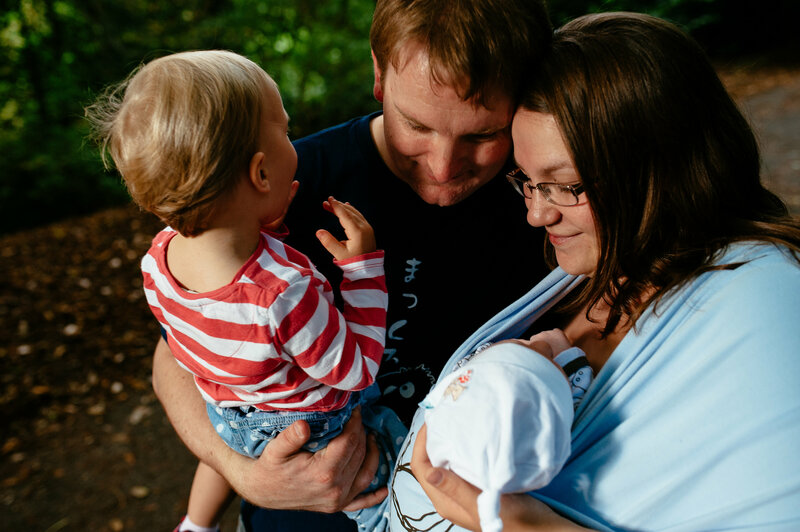 This is me with my little family in september 2013 – 3 weeks after the birth of our second child. I am a stay at home mum, 26 years old, married and mother to two children. My Daughter Winry currently 2 1/2 and my son Sameth currently 9 months. I was born and raised in Germany and moved to England in 2007 at the tender age of 19 after falling in love with an Englishman (to whom I am now married). I have two brothers who are both older than me and they, as well as my mum, still live in Germany.